We Need More 'Licensed Lay Deacons' In The Eastern District-LCMS, Huh? Despite what God's Word and our Lutheran Confessions say quite clearly about those who are to be called and ordained as His servants to His people, there is still much confusion and outright spiritual amnesia within Christ's Church. Even the most revered and well-respected Lutheran theologians have weighed in on this issue over the years with their own clear statements and quotes for discussion to help put the controversy to rest once and for all. And yet, the controversy and debate still continues to this very day! Sad, but true I'm afraid. It's been quite awhile since I've given any more thought to the topic of so-called "Licensed Lay Deacons" in the Lutheran Church-Missouri Synod (LCMS) following my own heart-breaking experience with it directly here in the Eastern District. In fact, the last Confessional Lutheran piece I remember seeing about the subject was from Pastor Chris Hull published last June 2014 (or over a year ago now). I recently returned from Madagascar where I, Professor John Pless, Rev. Bryan Wolfmueller, and Rev. Evan Goeglein, taught a group of Malagasy pastors the theology of Dr. Martin Luther. I was privileged to teach them Luther’s theology of preaching. While we were there, we had the opportunity to have meals with the pastors, coffee with the pastors, and other times outside of the lectures to discuss theology and church practice. One of the most discussed topics was the pastoral vocation. While here in the LCMS, most pastors have one church to tend to, and some men have as many as 4. I myself am the senior pastor at a church where there is also an associate pastor. In Madagascar, the average pastor shepherds no less than 10 congregations. After hearing that there is such a pastoral shortage, we asked if they would ever consider licensed lay deacons or some other program to get more pastors quicker, such as we have in the LCMS. They answered with a confident and comforting, NO, because the preaching of the gospel is too important to hasten the education of the pastor. Only the pastor should consecrate the elements and distribute the sacraments they said. How fat and lazy we are in the LCMS. We don’t work the devil to death in our study of God’s word, nor in the preaching of the Gospel. In the Large Catechism, Luther said, “Let them constantly read and teach, learn and meditate and ponder. Let them never stop until they have proved by experience and are certain that they have taught the devil to death and have become more learned than God Himself and all His saints” (Preface to the Large Catechism 20). Do we follow this exhortation of Dr. Luther? Of course not. Those who support the agenda of lay deacons or the fast track pastorate do not support this in that they do not see pastoral education as a top priority. They falsely place the LCMS in a state of emergency in order that ill equipped men may be the stewards of the mysteries of God. Until each pastor is tending to 10 flocks, and there are no pastors left, do we really need to act like the sky is falling here in the LCMS? The confessional group is not any better. Instead of tearing apart the Scriptures and the Confessions and letting God do the work of converting the heart, we take it upon ourselves to pass resolutions that would prevent further false practice in our Church body. We place our fear, love, and trust in the Whereas and Be it Resolved, instead of in the forgiveness of our sin purchased at Calvary and distributed in the means of grace. Preach you the Word and let the Holy Spirit worry about the weeds. Not that we should allow false practice in our Church, but we should do nothing more or less than proclaim the clear words of Sacred Scripture. The main point is this. No pastor in the LCMS is tending to 10 congregations. So lets cut out the act and get with the program. let us hear the faithful proclamation of Holy Scripture that says that the pastor is the one who stands in the stead of Christ, forgiving and retaining sins. What does this mean? If means that he should know what the Scriptures say in order that he may be reading in season and out of season. It means that, as we confess in articles 14 of the Augsburg Confession, the pastor should be rightly examined, called and ordained, in order that he may publicly preach, teach, and administer the sacraments. Let those who are faithful to Holy Scripture and the Confessions continue to be steadfast in the one true faith and never stop preaching the truth, even while the chicken little’s chant that the sky is falling and we’re the last hope of holding it up. Preach you the Word, stop being so fat and lazy. Preach you the Word and take heart, Christ does the work for you, Amen. A year before that, it was Pastor Charles Henrickson who himself admirably attempted to begin the process to "sunset Wichita in 2016" when he published both "Lay Deacons: Kicking The Can Down The Road?" and "Overtures On SMP And District Lay Deacon Programs" too. Unfortunately, I don't remember seeing anything else that substantial in regards to all of this (although it's quite possible I just missed it over the course of the past year). Regardless, I often think of a couple of things whenever this topic comes up for discussion. Augsburg Confession / Article XIV "Concerning the ecclesiastical order, (our churches) teach that no one in the church should publicly teach or administer sacraments unless he is rightly called." "All Scripture is debatable by Synod and profitable for win-win dialogue? Once we start voting on doctrine Miguel we have lost. That we can’t afford to do. A resolution “affirming closed communion” or “a literal 6-day creation” achieves nothing more than setting the precedent that such matters are to be decided by the Synod voting in convention. Confessionals putting forward doctrinal resolutions are plaiting the whip that will be used on our own backs the next time we represent 48% of the Synod in convention rather than 52% of the Synod in convention. Even if we win today, we lose tomorrow. The answer must be: “We don’t vote on matters of settled doctrine” that and electing leaders who will hold pastors to the standard of settled historical Lutheran doctrine and praxis." "I agree with you, but that would also essentially include showing the heterodox the door, wouldn’t it? (which it should, to be frank). Seems that church discipline would eliminate a lot of what needs to be 'voted' on (and I agree: doctrine is not up for vote)." For me, I tend to find myself in the camp that expresses that type of view. After all, when repeated attempts to dialogue with a brother or sister in Christ fail to bring them to repentance, and fail to bring them into agreement with the very things all Lutherans should be in agreement with, then what choice do you have except to exercise a little church discipline? The recent case involving Rev. Matthew Becker is a prime example, IMHO. 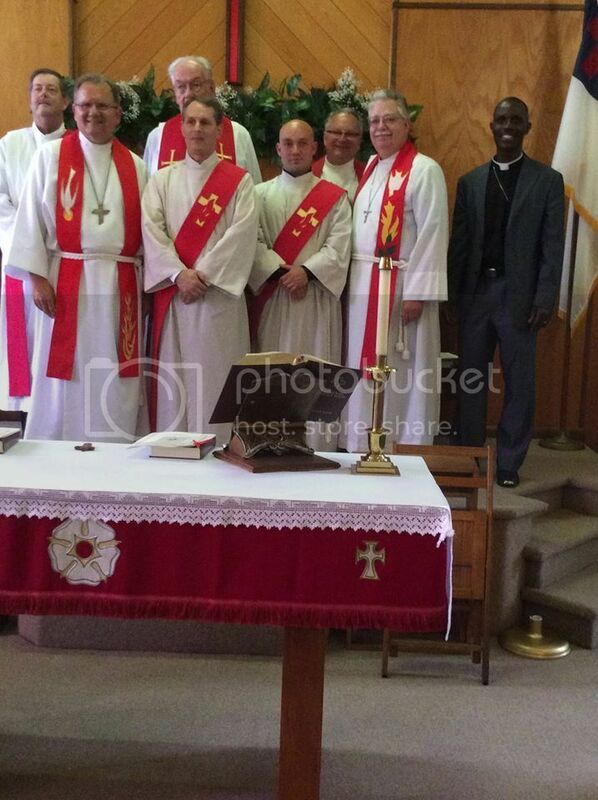 On Sunday, June 14, Charles Madison and Nicholas Wheeler were consecrated as Lay Deacons, licensed by the Eastern District, at Hope Community Lutheran Church in Red Creek, NY. Currently there are 10 Licensed Deacons serving congregations in the Eastern District. President Wicher has set a goal of 50 Licensed Deacons by the year 2020. Did you catch that last part!?! Eastern District President, Rev. Chris Wicher, wants 50 "Licensed Lay Deacons" by 2020! Really!?! Is that really necessary, especially with all the Pastors currently on "CRM" status (if that's what it's still called)? So, what then? Does this mean that any of next year's formal Overtures and proposed Synod Resolutions regarding this are pointless? Will they be a mere formality and just for show? I mean, he does know that this is very likely to be on the agenda, does he not? I can't say for sure, but how can he not since it's been a major lightening rod for debate going back many years now (and definitely back to the 2010 Synod Convention from what I've read)? Surely, a man of his stature and wisdom knows what the Word of God and the Augsburg Confession say, but as was the case with the recently suspended Rev. Matthew Becker, he just doesn't seem to care what our Book of Concord says let alone what nearly 500 years of Lutheran church history has to say about it either, otherwise, why publicize such an aggressive goal in the face of it all? Interestingly, the Synod’s Council of Presidents (COP), of which Eastern District President, Chris Wicher, is a member, met from September 20th to September 24th in St. Louis. On its first full day, the COP spent the heart of the morning continuing to refine a paper on the Office of the Public Ministry and agreed that "not everyone has the vocation of publicly preaching, teaching and administering the sacraments. This is clearly the pastor’s role. There is a pastoral office, and not just anybody can fill it." (SEE: http://blogs.lcms.org/2013/cop-delves-into-range-of-topics). Furthermore, this was a major topic for discussion during this past summer’s LCMS Convention to the point where the delegates agreed to create a special Task Force to begin developing a unified statement leading up to the next Convention so that the LCMS could begin to use Deacons more Biblically and in accordance with our Confessions and finally do away with the infamous “Wichita Amendment” to the Augsburg Confessions from the LCMS Convention in 1989. Resolution 4-06a was passed overwhelmingly and it directs the LCMS President to meet with a Committee over the next 3 years to figure out how to handle this situation appropriately. I guess by handling "this situation appropriately" that means simply ignoring it and doing what you yourself feel is right to satisfy your constituents (Proverbs 14:12; Proverbs 16:25). Power to the people! We need more "Licensed Lay Deacons" in the Eastern District-LCMS though, huh? To the tune of a total of 50 by 2020? I hate to sound so cynical, but that figures, doesn't it? We seem to have another case of saying one thing to doctrinally satisfy us Confessionals, but then doing another in practice to satisfy the more "Missional" and liberal-minded Lutherans in the LCMS. In a Lutheran layman's terms, when it comes to doctrine (including Ecclesiastical Order and the Office of The Holy Ministry) there is no place for "reasonable compromise" at all, and it is my firm belief that the LCMS needs to return to her First Love (Jesus Christ) and to her historical roots (her Lutheran Confessions) in order to face and overcome the challenges that confront us at this moment in time. I don't know about you, but I'll be fervently praying that we are collectively healed from our decades-long bout with spiritual amnesia (Jude 1:3). I'm in the Eastern district and I've talked with Pastor Wicher on a few occasions when we were putting out a call for a pastor. I won't attempt to defend anything he's said or his plans regarding deacons, but I will say we have 2 lay-deacons in our congregation who serve us well. For example, last Sunday, our pastor was away. One of our deacons led the service. He did not (and would not) serve communion. But since we couldn't schedule another pastor to come in, he was able to lead the service and preach a sermon. I don't think the plan is ever to have a lay-deacon baptize or serve communion, and he is there only to help the ministry when an associate pastor is not present. Not sure if that eases your worries, but I thought I'd let you know. I greatly appreciate your response here. I don't doubt the sincerity and good intentions of anyone who's a "Licensed Lay Deacon" in the LCMS right now, but I don't believe that pragmatism is a sufficient excuse for ignoring our clearly defined doctrine and practice. If anything, it's a shame that these faithful men of God haven't been taught that truth enough by those pushing the "Lay Deacon" program/process themselves. At the same time, I get what you're saying. As for the circumstances you mentioned regarding your church last week, that's a difficult position for you all to be put in. It would be one thing if it was an "emergency situation" since our Confessions make clear mention of the laity being able to perform the duties of the Pastor -- but only in the most extreme and rare occurrences (a.k.a. in the case of real emergencies). Otherwise, I would suggest that the exception has become the rule when it was never intended to be that way. My initial thought is that you all seem to believe and understand that -- which is fantastic and highly commendable (I wish more churches and Lutherans did!) -- because the Lay Deacon would not serve Communion. Bottom line, again, thank you for clarifying as it does ease some of my concerns, but I would still be very careful and continue to discuss this practice as a congregation to ensure that it does not become normal practice. An acquaintance of mine on Facebook, Kevin Yoakum, recently shared this in response to someone else who inadvertently brought up this topic. It's the recent statement about "LCMS Resolution 4-06a" regarding laymen performing pastoral duties. Hope that helps to further clarify things.